There seems to be many cats around the back alley these few days. Cats growling and howling at each other probably vying for a female’s attention or crossing path with other dominant males. Seems like Casper was able to hold his own ground. I didn’t see him running away like he used to. Casper had been his premium cat food pellet which the vet says will definitely give him bulk as compared with tuna can food. I guess he was right. Casper is a little bit bigger now, but he still demands for his tasty Japanese Careline tuna fish! Well once a day every evening and that’s it! He will have to settle his hunger with the premium food pellets. 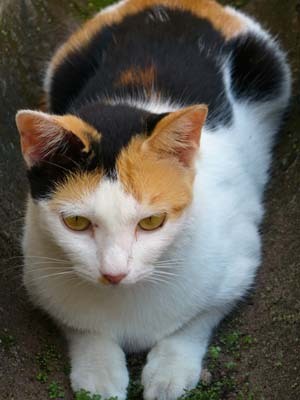 Seems like Shelly the tri-colored cat is the only female feline around the back alley. She must have really turned on every Tom cat around the area. I now see new cats coming from nowhere making all the cat calls, howling and hissing at each other. I didn’t really see Casper until this hot Chinese New Year afternoon. He seems to be able to hang on around and the other cats are wary of him. I guess the extra weight that he gained sure paid off some dividends. They will snarl at him and he will snarl back! Deadlock stalemate which neither wants to get into a sore fight. Well I hope it stays that way! 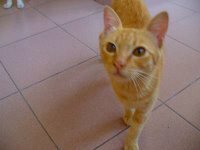 The orange ginger cat, Cika was the coolest cat around, so I guess they were quite chummy with each other. Though I have splattered Cika with water whenever he strayed into the house. No way am I going to let that fella come in and eat up the entire food pellet meant for Casper. Now he is rather wary of entering the house! Now there’s another silver cat coming into the house too! Just my luck, my toy water pistol was broken. I think I would need to get another one. Comes in real handy for precision shot at them! The back alley was beginning to become a cat community with all the cats about. 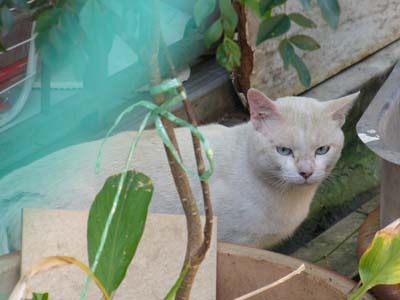 Hope good old Casper can stand his ground with the ever encroaching cats! A cat’s nutritional rnmuireqeets are much different than those of a dog. For example, cats require higher levels of protein than dogs. Cats must have the amino acid called taurine’ in their diet; dogs can actually make their own taurine. A cat eating food deficient in taurine can develop severe heart disease and other health problems. Almost all cat foods now contain added taurine.Cats require a different form of Vitamin A than dogs do. Dogs can use beta-carotene as a source of Vitamin A; cats cannot. 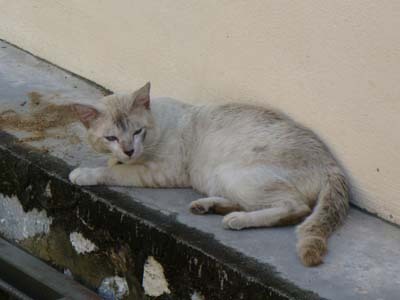 Cats can not manufacture the fatty acid called arachidonic acid’ and must have it supplemented in their diet; it is not essential for dogs to have this fatty acid in their food.So, you see, if a cat is allowed to eat a significant amount of dog food, the cat would be eating a diet deficient in many of the cat’s required nutrients. For your cat’s health, be sure she is eating quality cat food.